Follow this link to find the club golf web site. Lots of info and things of interest for the junior golfer and coaches alike. The juniors final night was held on Monday 3rd September with 13 juniors attending. With 7 children in contention for the summer ringer trophy all was to play for. The six hole course they have been playing this season was proving fun with a high degree of difficulty, the greens were quick with many players taking several putts making scoring very close. It could not have been closer as two players Fraser Cooper and Felix Rushton-Myers came in with the same scores meaning they share the Austin HourstonTrophy. Well done to both players. In the longest drive Alex Thomson almost drove to the first ditch, which was declared the winning drive. 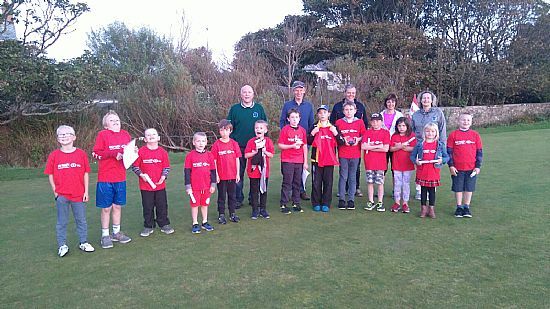 The younger players held a mini competition of putting,chipping and the longest drive. 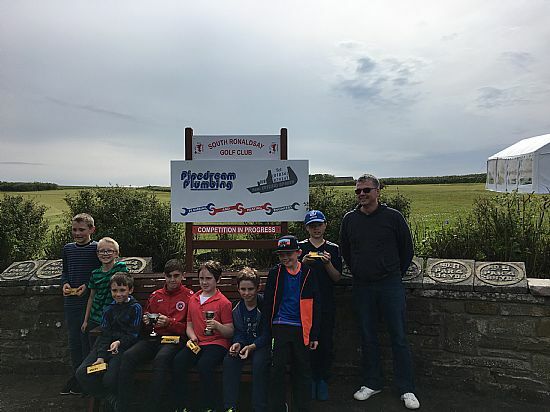 This years winner was Dagan Edwardson, who won in all three of the mini competitions winning the medal for 2018. After the competition the young players tucked into a well deserved snack, followed by the presentation. Well done everyone, see you next year. This afternoon we held our first junior open sponsored by pipe dream plumbing. Glen Rosie won the 9-hole section and Fraser cooper was runner up, Felix Myers won the 6 hole section with Einar Thomson as runner up. In the putting challenge Alex Thomson was the winner. Thank you to all who came and played and thank you to the volunteers from the club that helped out during the day and to the ladies for the goodies at the end. A special thanks has to go to Andy Gunn of pipe dream plumbing for the trophies and support. This will now be a permanent fixture so let’s make this bigger next year. Sunday 25th Aug 2013 saw 4 Juniors play in the HEAT ORKNEY Kirkwall Junior open. Ciaran Drever did very well in the 18 hole section coming home with a very respectable Nett 69.